wonderful state which makes art inevitable." "I was meant to do this." Everything about painting is a joy for me - the study, the struggles, the work. I am drawn to the soft and dreamy quality of watercolor marks and letting my muse guide me I try to reveal just the essence of my subject. Before picking up the brush, I put myself in a quiet place. The studio is clean, music is playing, perhaps a scented candle is lit. I begin - and since watercolor loves to have her way - I let go. Moving through my paintings, I often hear the voices of my teachers and give thanks to have had them on this wonderful journey. 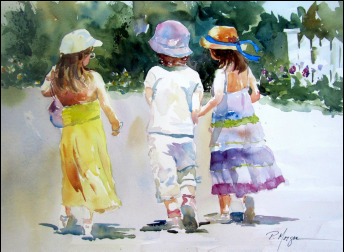 Over the last several years I have fallen in love with painting the figure, especially children. There is such tenderness in their gestures and I feel blessed when I can capture this in my work.